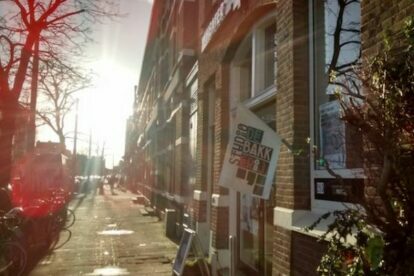 Studio de Bakkerij, a place I found out about due to the noise of partying people keeping me awake. That doesn’t sound too positive though it made me curious about what was going on and why I wasn’t there drinking beer and having fun with them. Studio the Bakkerij is one of those treasures well hidden in the old northern part of the city. A place you will enjoy from the moment you step inside. It’s a small gallery/theatre located at the Bergweg, close to the Noorderboulevard (Check the Noorderboulevard article). CineNoord also shows movies at Studio The Bakkerij. Once you come in you’ll see a small bar surrounded by a couple of tables and chairs filled with locals having a chat about whatever is going on in their lives. Get yourself a beer and it will feel like home in an instant. The main reason for me to visit the studio is to watch a movie presented by CineNoord or to visit a stand-up comedy show. They also host cabaret, theatre plays for kids (and grownups, keeps you young!) and a show dedicated to musical talents from all over the country. As in many cases, check their website to get to know the program. Thanks to the neighborhood Studio de Bakkerij / CineNoord received a bunch of money from the local government, new comfy seats have arrived! If you’re a Dutch speaker then you should visit the show of ‘Oma Greet’, what a wonderful lady she is!